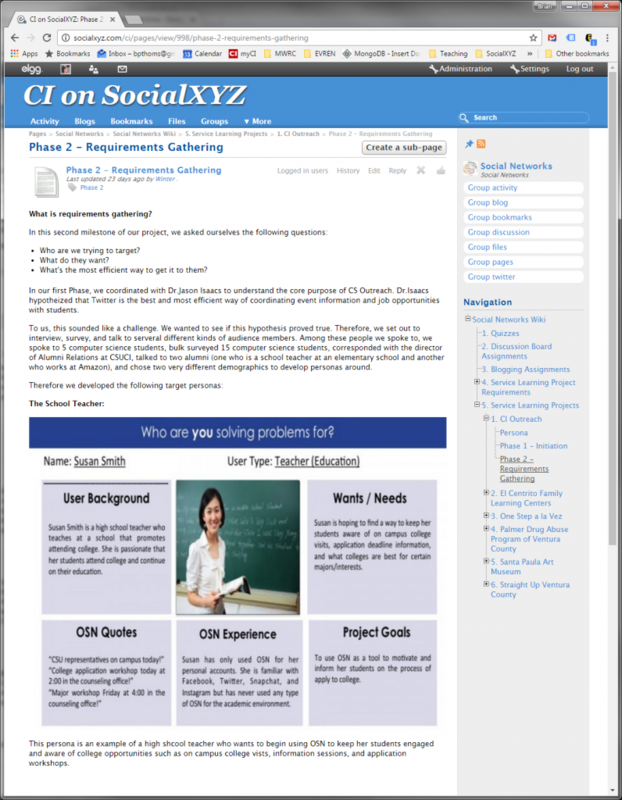 This semester I implemented a service learning component to my COMP342 course, Internet-based Social Networking. The course is cross-listed with communications and sociology, but the course is much more than that and, this semester, services students from performing arts, art, psychology, health sciences, business and liberal studies. As an upper-division interdisciplinary general education technology elective, COMP342 introduces students to concepts from sociology, computer science, media studies, and philosophy to understand internet-based social networks, cultural and structural conditions of online communication, virtual identity construction, management of digital media, and the impact online social networks have on various institutions of society. More so, the course explores social networking in both on-line and off-line spaces and introduces how widely popular internet-based social networks, such as Facebook, Instagram and Snapchat, can have an effect on the formal organization, including non-profit organizations and college campuses. 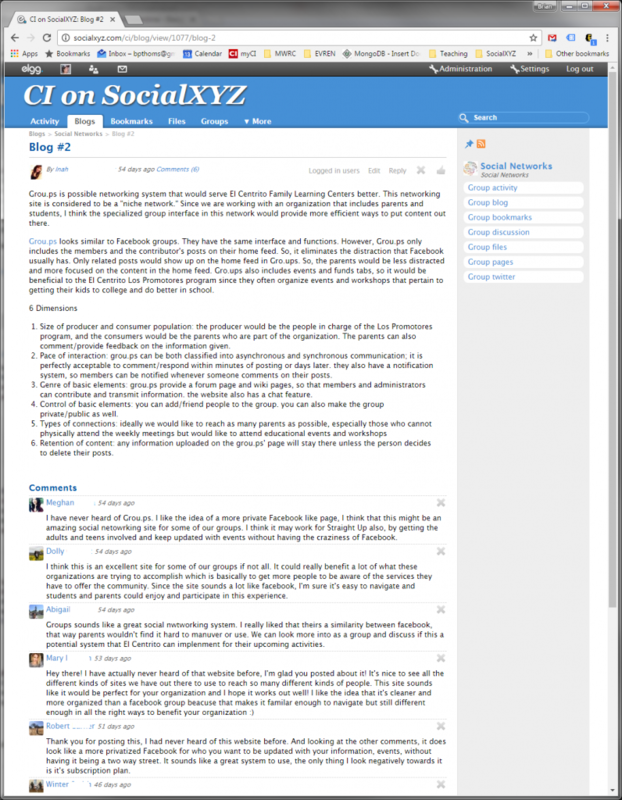 In past semesters, I have implemented high-impact practices into COMP342, requiring all students to participate in an online course learning community, SocialXYZ, which I host on http://socialxyz.com. In spring 2016, during Project OLAS, I explored ways to integrate service learning into COMP342. I had this vague notion that millennials, who are already well versed in the art of internet-based social networking, might facilitate non-profit organizations in their social media endeavors, while learning a thing or two about the non-profit world in the meantime. Thus, my endeavor began. As my first attempt at implementing service learning, I focused on low-hanging fruit that would allow students to develop an overall social media strategy for their partner organizations based on various material covered in COMP342. The timeline of events and evolution of course content can be organized into the following categories. During the project kickoff, I met with the Center for Community Engagement, specifically Dennis Downey and Pilar Pacheco, to discuss approaches to service learning. Both were instrumental in educating me on the potential benefits of service learning for students, faculty and our community partners. They also provided numerous external resources and presented exemplary service learning projects conducted at CI. The next steps involved modifying the COMP342 syllabus. 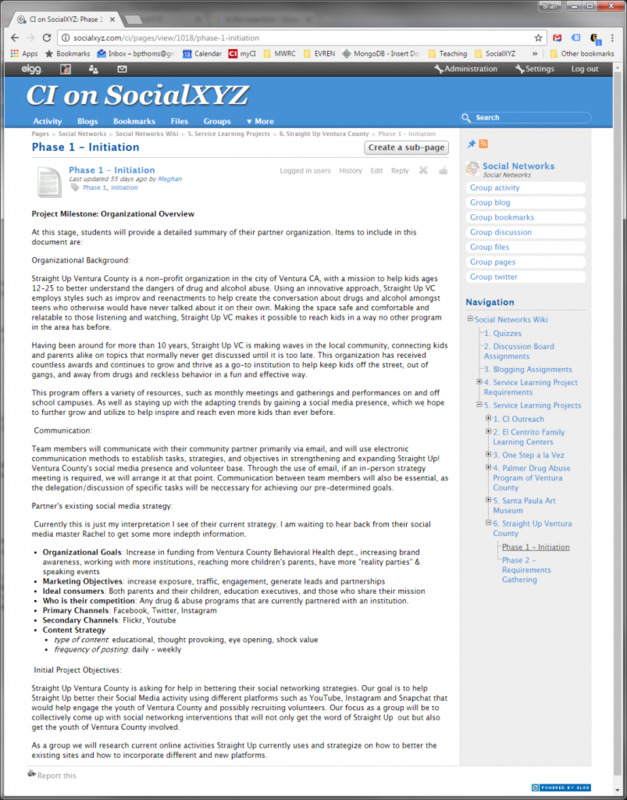 First, I altered the final project and presentation to be centered on service learning with the added twist that it be collaborative and constructed using the SocialXYZ wiki. Additionally, I modified course milestones, which typically consisted of online discussions and blog reflections to be centered on service learning activities. I also constructed a new document to carefully outline service learning expectations for students. This document helped frame service learning as defined by CI policy, which is “a teaching and learning approach that integrates community service with academic study to enrich learning, teach civic responsibility, and strengthen communities, while engaging students in reflection upon what was experienced, how the community was benefited, and what was learned.” The document also identified required time commitments for students. With the help of the Center for Community Engagement, including Pilar Pacheco and Kaitlyn Cotton, I was able to meet with eight service learning partners prior to the start of the spring semester, with six partners confirming their participation for spring. These meetings consisted of email, face-to-face conversations and phone conversations and helped to narrow-down the project scope, establish student-partner expectations and re-confirm time-commitments. As agreed upon, the project would be flexible, but would focus on 1) developing an overarching strategy for how organizations might adopt a specific social networking strategy or 2) reexamine the organizations existing social networking strategy. This project would be a collaborative effort between students and partners where students learn key concepts from COMP342 and align them with the needs of their partner organizations. Service learning projects were broken into multiple milestones as follows. During Phase 1, Project Initiation, students were introduced to our community partners, including El Centrito Family Learning Centers, Palmer Drug Abuse Program of Ventura County, One Step a la Vez, Straight-Up Ventura County, Santa Paula Art Museum and CI Outreach. During the first week of classes, community partners presented students with the mission and scope of their organization. This also provided students with the chance to meet with partners during break-out sessions. Phase 1 also required students to select a partner and learn more about the organization’s mission and scope and present the information back to the classroom using the SocialXYZ wiki, illustrated in Figure 1. During Phase 2 – Requirements Gathering, students performed a more detailed analysis of existing OSN technologies to gain an understanding of various social technologies that support individuals and groups. During this phase, students also worked with community partners to identify OSN strategies that could support organizational needs identified during Phase 1. At this stage students learned more about their respective organizations and constructed Personas, which are a systems design technique for understanding and characterizing individual users of a system, illustrated in Figure 2. Students were also required to align specific internet-based social networking technologies within the social media design framework (SMDF) to understand what aspects of the technology may be useful for their partner organization, illustrated in Figure 3. During Phase 3 – Implementation, students will finalize their working framework or design document for how organizations can achieve the objectives set forth in Phase 1 and Phase 2. This can be a set of guidelines or best practices for how they might integrate social networking technologies into their partner organization. This milestone will be managed through the SocialXYZ, which will be opened up for sharing with our community partners. In fact, this wiki document will serve as the primary artifact for knowledge transfer. During Phase 4 – Presentation, project teams will construct a comprehensive poster that will highlight their work and achievements during the semester. Invitations will be sent to community partners to attend the Celebration of Service event held by the Center for Community Engagement. The event will allow students to share their findings, not just with their specific community partner, but with all of our community partners. Additionally, posters will be uploaded to SocialXYZ and classmates will have the opportunity to reflect on their service learning project and respond to the work of their classmates. Overall, I have had a valuable experience introducing service learning to my COMP342 course and believe that students and community partners benefited as well. Faculty Benefits of Service Learning: From my own perspective, adding service learning to COMP342 allowed me to frame academic content in the context of some real-world organizational need and many course assignments were tied directly to student-progress with their community partners. Additionally, adding service learning to COMP342 helped strengthen my connection with one of CI’s core mission pillars and provided me the opportunity to work closely with members of the Center for Community Engagement and engage with many dedicated community partners. Student Benefits of Service Learning: For students, a revamped COMP342 challenged them to align core COMP342 concepts with the needs of our community partners. In doing so, students were tasked with developing a solution to a real-world problem through team collaboration and partner coordination. In the process, students also developed rich relationships with their classmates and community partners as they modeled user-populations and constructed viable strategies for social technology adoption. Partner Benefits of Service Learning: For our community partners, COMP342 provides a new lens for viewing how social networking technologies might be adopted within an organizational setting. In addition to possible technical improvements, COMP342 has also helped our partner organizations enhance awareness of their organization as students present their work in a public forum.